Humans find Cherries to be healthy, delicious and enjoyable. But what about dogs? Are cherries bad for dogs? Do they enjoy cherries as much as we do? If you are concerned about whether your furry friend should eat cherries, then we have got you covered. Cherries are not bad for dogs. 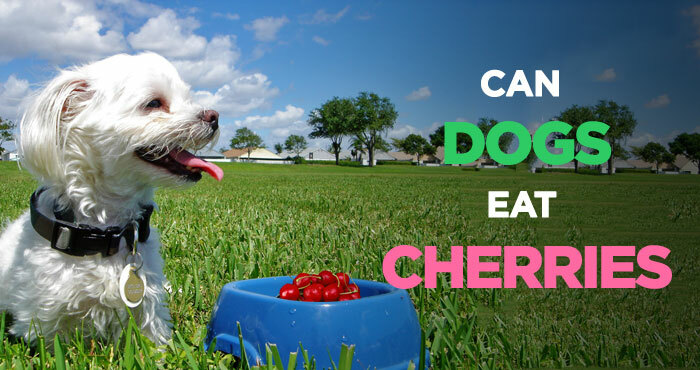 In fact, cherries can be beneficial to the health of your dog depending on how you are going to feed him. Of course, there are several pitfalls that you have to put into consideration before going ahead to have them for your dog. First of all, if possible, you may consider avoiding or skipping cherries at all. There are problems your dog may encounter that will outweigh the benefits. The fruit contains a seed that has some level of cyanide, which is poisonous for your dog. Feeding whole fruit to your dog is dangerous, if not downright fatal. The seeds from persimmons can cause inflammation of the small intestine in dogs. They can also cause intestinal obstruction. Obstruction is also a possibility if a dog eats the pit from a peach or plum. Plus, peach and plum pits contain cyanide, which is poisonous to both humans and dogs. Cherries are therefore not a necessary part of your dog’s diet. 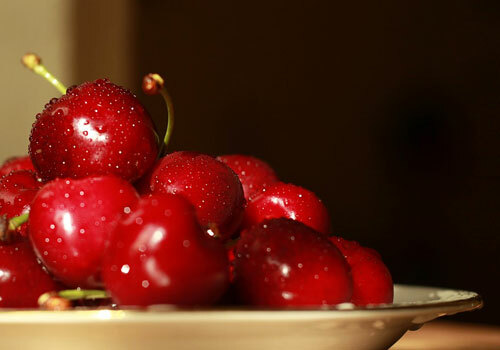 When giving cherries to your dog, ensure you strip off the stems, leaves, and the pits since dogs can only feed on the fleshy part of the fruit. 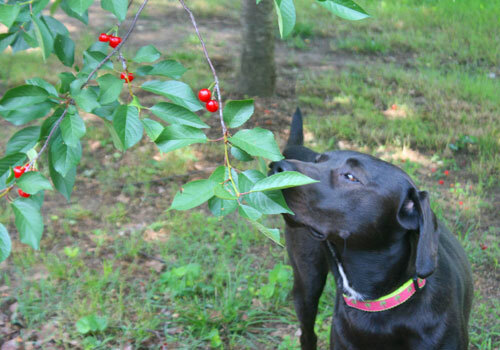 Let’s dive into a bit more details about whether are cherries safe for dogs or not. Are Cherries Good for Dogs? Probably you’ve given your dog Cherries before. If not, then it is important to know that dogs can eat the fruit, there is no doubt about it. Cherries are good for dogs when prepared properly and given in moderation. Cherries contain antioxidants known as anthocyanins. These antioxidants help reduce heart disease, reduce inflammation, prevent cancer and reduce symptoms of arthritis. One of the antioxidants is known as melatonin, which helps in regulating the sleeping cycle and heart rhythms of dogs. These fruits contain a lot of Vitamin A compared to strawberries and blueberries. They are also a rich source of potassium, magnesium, fiber, iron, vitamin C and Vitamin E.
These nutrients are greatly beneficial to your dog’s health. Fiber is an important part of your dog’s digestion. Cherries also play a significant role in preventing memory loss as well as keeping brain health in both dogs and humans. Other benefits include reducing the risk of diabetes, weight maintenance, and reducing joint soreness for active dogs. As mentioned earlier, the seeds, leaves and pits need to be removed before the fruit given to the dog. Watch this video to understand why dogs shouldn’t eat cherry seeds. The seeds are the main source of cyanide in cherries, which can be poisonous to dogs hence they should be stripped off from cherries before your dog eats them. Before serving cherries to your dog, ensure you wash them properly and remove the seeds. Dogs and cherries, don’t go together. Although, cherries are not dangerous to dogs, but it is one of the foods that can be poisonous for them. Cherries are considered toxic and may result in several health risks to dogs. Other than the flesh around the seeds of the fruit, the rest are considered toxic which contain cyanide. This explains why the ASPCA warns against feeding them to pets and lists them as unsafe. The cyanide content in the pit, seeds, and leaves of the fruit inhibit the enzymes necessary for the transportation of oxygen to the cells. Resulting, your dog may, therefore, experience problems in oxygen uptake. If your dog eats many unprepared cherries, he will show symptoms of poisoning due to the cyanide. You need to look for the signs, such as difficulty in breathing, inadequate oxygen levels, dilated pupils, and bright reddish gums. If you find symptoms mentioned above in your dog, then immediately take him to your veterinarian. Any delay can be fatal for his life. Some dogs may go into shock or even die especially when it is a severe case. Some dogs may even show symptoms, such as diarrhea and stomach upsets. To avoid complicating things any further, you better keep cherries away from your dog’s reach. You also shouldn’t feed him with cherries on a regular basis since this may cause more harm than benefits. Apart from choking, the pit in the fruit may result in problems in your dog’s digestive system. If you don’t serve them in a safe way, be prepared for the worst. To save yourself from taking a lot of precautions with cherries, consider other alternatives such as apples which your dog can enjoy eating. Also, cherries are tasty and incredibly sweet. Dogs process sugar differently compared to humans. If given without moderation, this will also result in many health problems. My Dog Ate Cherries! What to Do Now? Probably you left your stash of cherries in the open, and your dog found his way and ate them. We now already know that cherries are poisonous or rather toxic especially when the seeds, pits, and leaves are not removed. Also, when fed in excess, they pose a health risk to your dog. In case, your dog ate some cherries, without hesitating call the Animal Poison Control Center at (888) 426-4435. They offer assistance with treating your poisoned pet. 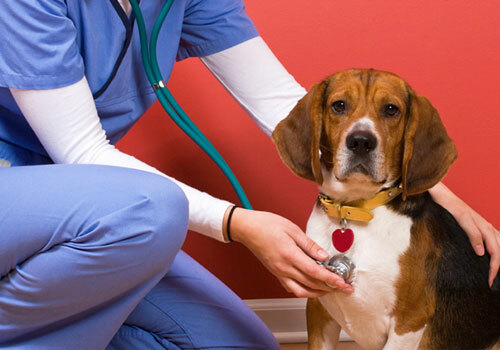 You may also contact your vet to examine your dog and advise accordingly. The best way you can help your dog is by acting immediately. If you are not sure of poisoning or the quantity he fed on, watch out for any of the symptoms mentioned above. At first, your dog may appear to be fine, but it is important that you keep an eye on him for any changes in his overall health. Assuming that everything will be okay will be making things worse. Consider taking your dog to an emergency clinic in case of shock or signs of unconsciousness. 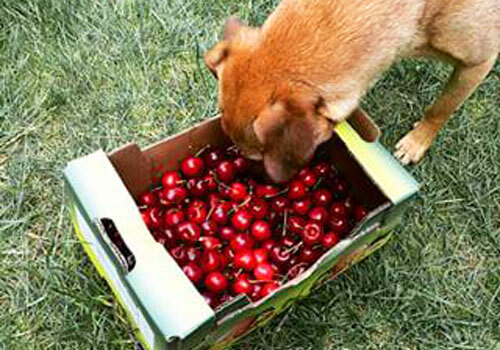 Always avoid bringing cherry pits to your yard or exposing cherries to where your dog can easily reach. Cherries have health benefits for dogs if the seeds, pit, and leaves are removed. The antioxidants, vitamins, and other nutrients in cherries are necessary and beneficial to dogs. 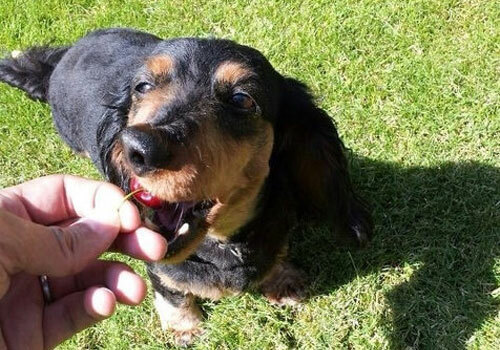 To summarize… can dogs eat cherries? Absolutely yes, but in moderation and if they are well prepared. Besides the flesh, the other parts of the fruit are harmful since they contain toxic chemicals. Cherries for dogs may not be the best idea for pet owners since there are other alternatives which do not need a lot of precautions. However, if you must give your dog cherries, prepare them properly by washing and removing the seeds, pit, and leaves from the fruit. I have a Chihuahua (9 #) that can run & scoop & eat any/everything. The wild black cherries are tiny, about the size of a pea, so it is mostly pit. I’ve even tried to muzzle my little guy since it’s so hard to keep him from eating these – without much luck. Can you/anyone give me some insight as to how many ingested seeds may be toxic for a small dog? The few cherries will likely only cause a stomach ache for the dog, unless it ate in a large quantity (more than the size of his paw). If your dog ate more, then you may want to take it to the vet, as the pits may cause an obstruction in the intestines. Otherwise just let them pass. Increase the amount of fiber in your dog’s diet over the next several days until it passes the pits. You can do that by purchasing a high-fiber dog food or simply somehow getting your dog to eat more grass than usual. Dogs can eat anything. Poisonous, blocked bowel, whatever. If they get it in their mouths its probably gone.